Many company leaders understand that in order to survive in today’s business world, their companies must have a social media presence. But to the detriment of many organizations, strategy is lagging (way) behind. On Facebook, users who “like” the company’s page find their newsfeeds are bombarded with promotions, surveys and so called news. Meanwhile, clients are posting positive and negative feedback on both sites. Sometimes these comments receive responses; sometimes they don’t. And that’s not even taking into account LinkedIn, Pinterest, the company’s blog and everything else. In using such a scattershot approach to social media, you’re missing out on major opportunities to engage with potential and current customers, manage your reputation — and you may be alienating social media users in the process. doing, how well you’re doing, what you should be measuring and what the ROI is of your social media program. If your company is going to enter the social media world, you need a strategy because it standardizes messaging, determines how resources are used, defines which tactics you will and won’t pursue, serves as a road map and will still carry on its purpose through personnel changes. When formulating a strategy, be sure to look at the implications it will have on all of your internal stakeholders and include them in the planning. Here are 11 components of a comprehensive social media strategy. Be consistent across all channels. Most businesses already have brand guidelines (including naming, color scheme and imagery), and these should be applied to your social media properties as well. After all, branding is all about consistency. The challenge, though, is that most branding guidelines don’t include any guidance for the most important part of your brand in social media conversations: your voice. Although your brand guidelines might make mention of tone and vocabulary for use in web copy, social media will challenge those guidelines when you need to have a conversation with an average person. In most instances, it’s okay to be less formal on social media channels — simply make sure your updates, statuses, comments, etc. speak with a unified voice. In the planning process, be sure to ask who represents the voice of your company in your social media branding guidelines. Engage in conversation. Although cynics might dub it a mindless vacuum, social media is about the convergence of communication and information. That being the case, what you share and talk about with social media users is important. Content provides the medium to help you engage in conversation — and creating content that is truly resourceful and shareable can have many long-term benefits to your company’s social media presence. Keep in mind, content isn’t just about blog posts, photos and videos. Presentations, infographics, memes and even discussions (such as in a LinkedIn Group) are all types of content that should be considered for your social media strategy. Share meaningful content. If you’re simply talking about yourself in social media, no one wants to listen (much like regular conversation). It’s only when you begin to curate content that is of interest to your followers and promote it, together with your own content, that your social media accounts begin to breathe new life. Join the right networks for your company. There are currently more than 50 social networks with more than 10 million members. You can’t — and shouldn’t — have a presence on every single one of them. Deciding which social networks in which to engage, and creating internal best practices and tactical plans for each of these networks, will form a sizable part of your social media strategy. Post strategically, not constantly. No two social networks are alike, and with limited resources, you’ll need to decide how much time you are going to spend on each platform, as well as what you’ll be doing there. This will help you to maximize your ROI for time and resources spent. It’s also important to tweak your frequency strategy for each social network from time to time so as to maximize the effectiveness of your posting. Believe it or not, frequent posting doesn’t necessarily make your social media more effective. Research shows that when a brand posts on Facebook twice a day, those posts receive only 57 percent of the likes and 78 percent of the comments per post that a single post receives. Be worthy of being followed. Engagement should be considered in both its proactive and reactive forms. 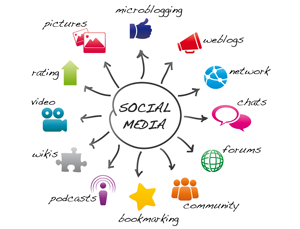 While most companies do well at proactively engaging with their own content — posting both new content and conversations, as well as the sharing of content and information from others — proactively engaging with new social media users and reactively engaging with those who comment or respond to your updates is equally important to create an effective social media presence. And remember, engagement is a tactic to help you achieve your objective — namely, expanding your brand, attracting new customers and growing your company — not the objective itself. The odds are in your favor. Sixty percent of Facebook fans and 79 percent of Twitter followers are more likely to recommend brands that they’ve ‘liked’ or followed. Interact meaningfully with customers. From complaints to questions to praise, consumers (67 percent, in fact) are using social media to convey their thoughts, opinions and queries. But, many companies are blowing this golden opportunity. For example, a recent study showed 71 percent of customers who complained via Twitter were not contacted by the company. Your company needs to have a listening — and responding — strategy in place. Listening means more than merely being on the lookout for complaints to defuse. Every engagement with a social media user is a golden opportunity, because it can give you real-time feedback on what your customers are thinking, liking, needing, buying, etc. You can also use big social data to help understand potential future trends for your products and services. Regularly introduce new ways to engage customers. Social media campaigns should not be confused with traditional campaigns that are used in marketing to promote new products or discounts. In the social media world, you’re not speaking to or at customers; you’re speaking with them. That being the case, social media campaigns should leverage the social aspect of social media, combined with its viral functionality, to create events that trigger engagement from followers in a new and exciting way. Think of it less as a promotional marketing campaign and more of an experiment to better understand — and more effectively engage with — your social media followers. Create and implement new campaigns on a regular basis around revolving themes, such as those aligned with promotional, calendar or seasonal events. Remember to make your campaigns platform- and/or content-specific to help give you more precise data for your future planning. Take a cue from other users. There’s no need to navigate the world of social media on your own. Use the examples and successes of other users called influencers to help shape your own strategy and make it more effective. Influencers can consist of individual users, companies or media outlets that 1) are a part of or serve your target demographic audience and 2) yield influence online through reporting, blogging, and being active on platforms such as Twitter, Google+, Facebook and LinkedIn. You can use website rankings, social numbers (such as the number of Facebook fans or Twitter followers), social engagement and frequency of engagement to identify influencers within your target demographic group. Furthermore, websites such as Klout, which scores 400 million users and analyzes 12 billion social signals each day, can provide data to help you measure influence. At minimum, influencers provide a source for content curation, and by retweeting their content, you increase the chances they’ll notice you and reciprocate the favor, thus broadening your reach in social media. Recruit fans to spread the word. Brand ambassadors are current loyal customers and fans who help spread the word about your brand through their own social networks. Harnessing and rewarding ambassadors is a very effective way to help spread the word and value of your brand throughout social media because 92 percent of people trust recommendations from friends and family more than all other forms of marketing. Whether they are current employees, alumni of your company or loyal fans to your brand, your social media strategy should always be looking for ways to engage — and reward — brand loyalty and amplification in social media. Be prepared to handle trouble. Given the speed at which information travels in social media and the fact that social media is now a primary news source for consumers and the media, it is inevitable that some sort of crisis will occur. Your company needs to always be prepared for the worst. Completely integrating social media into your company’s crisis management planning is a very wise decision: 76 percent of social media crises could have been diminished or averted with the proper social media investments. Make sure that your crisis communications plan includes messaging for each of the social media channels in which you’ll be investing. Beyond that, make sure your employees are proficient at the social media tools your organization uses so they won’t inadvertently make a crisis worse. Secondly, you should try to proactively build a community of goodwill with followers of your brand. Over time, your word will become more trusted, and more brand advocates will be born. Regardless of your company’s social media goals, make sure you address all of these concepts individually in a written document so everyone in your company — now and in the future — understands what they are and how they’re meant to work together. The clearer you are, the more productive your organization’s social media presence will be.